I think I am addicted to this magazine. I picked up a copy on a whim because of a Thin Lizzy article. And I had a gift certificate from Christmas for Chapters. The Lizzy article turned out to be one of three and very interesting. I ended up buying the subsequent magazines just to finish the story. It's one of the few mags that I have read cover to cover in recent memory. It happens to jibe with my current taste in music. And the Blues Rock special issue is killer. It's given me more cd's to hunt down. Subtitled: Eric Clapton & the British Blues Boom. This book was inspired by an idea to un-cover the last corner of Eric Clapton's career. Specifically the time period between 1965 and 1970. It is done in a day by day, year by year format detailing performance dates, recording dates and press interviews and releases. It is fascinating to trace the history as it unfolds. The author, Christopher Hjort, has done a lot of research and pieced it together with his own assumptions when evidence was not available. By this I mean some things documented are placed in likely order based on events before or after. A lot of players wander through this history but it is mainly focused on Eric, Peter Green and Mick Taylor and the various groups they were in. But it's not just the history, the photographs are impressive as well. The book opens with a shot of Eric Clapton crouched beside two Marshall stacks with an original 'burst. I don't know enough about Clapton's early career to say if it's the "Beano" burst but I have read comments in interviews with him that he could never find another that suited him, and therefore never replaced it. This book is just a great read for fans of the players and the period. One great band that spawned two great bands. Steve Marriott left to form Humble Pie with Peter Frampton and the remaining members recruited Ron Wood and Rod Stewart to re-define themselves as The Faces. I can remeber hearing this on the radio when I was a child. I actually think that part of this classic music kick I am on is a search for half remebered songs from the radio. Tunes that have been buried in my memory from my older siblings playing their records or the car radio on long trips. Ronnie Lane must have been a rather tiny person. That bass looks bigger than he is, altough it might be the camera angle. This is the album that turned me on to Mike Bloomfield. I also realized that Al Kooper ( Bood, Sweat and Tears) was an absolute master of the B3. If there is any keyboard that defined a genre it's the B3. Bloomfield did about half the tracks before he checked himself into a hospital ( or had an anxiety attack, I can't remember which from his biography)and Stephen Stills came in to finish off the session. One of Stills' tracks, Season of the Witch, was recorded live at The Fillmore in December of 1968 ( the 13th to be exact, which thirty years later would be the day my daughter was born) with Mike Bloomfield on guitar. I find it interesting to listen to the differences in approach between the two and the evolution of the song to live performance. It's a bit shorter with Bloomfield staying within the context of the studio recording but adding his own unique personality. Posted by Jon at 9:04 a.m. I would like my den to look like this, but it doesn't. This is the first run of the Page Signature. These are aged to look like the original. I count 26 so I assume Jimmy gets his choice and the other 25 will list for $33,500. 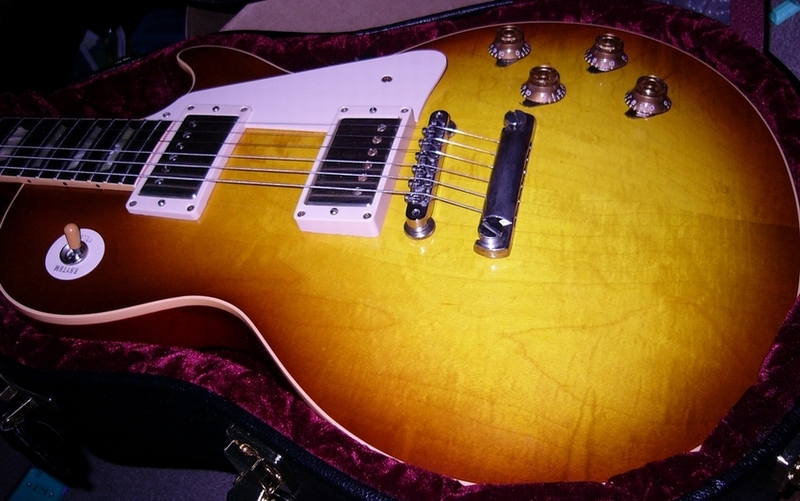 Way too much money for me but I predict, like the 25 aged custom shop LP signatures, they will increase in value from the starting gate. 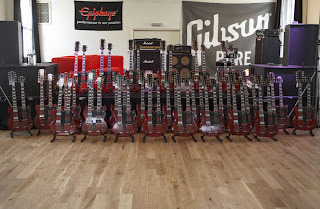 From all accounts just beautiful guitars but the Epiphone banner in the back kind of ruins the picture, for me anyways. A Yardbirds take on this song. Different lyrics though. I always knew that Page carried over a fair amount of stuff from this group but never really knew specifics. It's interesting to see how much was kept for the Zeppelin version and what changed. Ever been to Wolfgang's vault? Amazing site. Wolfgang Grajonca fled Germany for the United States and changed his name to Bill Graham. Sound familiar? The Fillmore? All those great concerts? Bill Sagan aquired the huge collection of Bill Graham's memorabilia and concert recordings and has them for sale on his site. There are about 300 concerts available for streaming and some for download at a pretty reasonable price. I found two Led Zeppelin concerts from 1969 which are legendary. There's also Humble Pie, Mountain and Black Oak Arkansas to name but a few. Probably one of the best sites I have ever come across. Except for mine of course.